The Great Depression stands as an event unique in American history due to both its length and severity. With the unprecedented economic collapse, the nation faced “an emergency more serious than war” (Higgs 1987, p. 159). 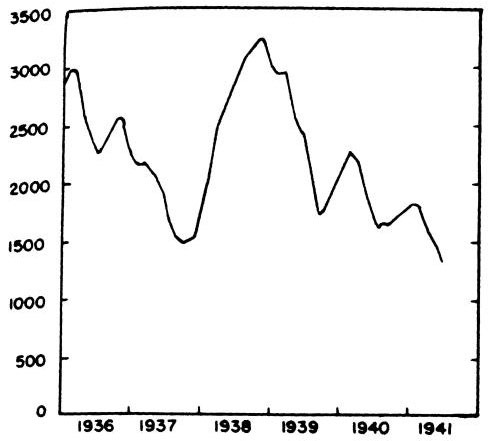 The Depression was a time of tremendous suffering and at its worst, left a quarter of the workforce unemployed. During the twentieth century, the annual unemployment rate averaged double-digit levels in just eleven years. Ten of these occurred during the Great Depression. A confused and hungry nation turned to the government for assistance. With the inauguration of Franklin Delano Roosevelt on March 4, 1933, the federal government’s response to the economic emergency was swift and massive. The explosion of legislation — which came to be collectively called the New Deal — was designed, at least in theory, to bring a halt to the human suffering and put the country on the road to recovery. The president promised relief, recovery and reform. Although the Civil Works Administration (CWA), the Civilian Conservation Corps (CCC), and the National Recovery Administration (NRA) were all begun two years earlier, the Works Progress Administration (WPA) became the best known of the administration’s alphabet agencies. Indeed, for many the works program is synonymous with the entire New Deal. Roosevelt devoted more energy and more money to the WPA than to any other agency (Charles 1963, p. 220). The WPA would provide public employment for people who were out of work. The administration felt that the creation of make-work jobs for the jobless would restore the human spirit, but dignity came with a price tag — an appropriation of almost $5 billion was requested. From 1936 to 1939 expenditures totaled nearly $7 billion. Annual figures are given in Table 1. Source: Office of Government Reports, Statistical Section, Federal Loans and Expenditures, Vol. II, Washington, D.C., 1940. The legislation that created the WPA, the Emergency Relief Appropriation Act of 1935 sailed through the House, passing by a margin of 329 to 78 but bogged down in the Senate where a vocal minority argued against the measure. Despite the opposition, the legislation passed in April of 1935. Harry Hopkins headed the new organization. Hopkins became, “after Roosevelt, the most powerful man in the administration” (Reading 1972, pp. 16-17). All WPA administrators, whether assigned to Washington or to the agency’s state and local district offices, were employees of the federal government and all WPA workers’ wages were distributed directly from the U.S. Treasury (Kurzman 1974, p. 107). The WPA required the states to provide some of their own resources to finance projects but a specific match was never stipulated — a fact that would later become a source of contentious debate. The agency prepared a “Guide to Eligibility of WPA Projects” which was made available to the states. Nineteen types of potentially fundable activities were described ranging from malaria control to recreational programs to street building (MacMahon, Millet and Ogden 1941, p. 308). Hopkins and Roosevelt proposed that WPA compensation be based on a “security wage” which would be an hourly amount greater than the typical relief payment but less than that offered by private employers. The administration contended that it was misleading to evaluate the programs’ effects solely on the basis of wages paid — more important were earnings through continuous employment. Thus, wages were reported in monthly amounts. Wages differed widely from region to region and state-to-state. Senator Richard Russell of Georgia explained, “In the State of Tennessee the man who is working with a pick and shovel at 18 cents an hour is limited to $26 a month, and he must work 144 hours to earn $26. Whereas the man who is working in Pennsylvania has to work only 30 hours to earn $94, out of funds which are being paid out of the common Treasury of the United States” (U.S. House of Representatives 1938, p. 913). Recurring complaints of this nature led to adjustments in the wage rate that narrowed regional differentials to more closely reflect the cost of living in the state. Robert Margo argues that federal relief programs like the WPA may have exacerbated the nation’s unemployment problem. He presents evidence indicating that the long-term unemployed on work relief were “not very responsive to improved economic conditions” while the long-term unemployed not on work relief “were responsive to improved economic conditions” (Margo 1991:339). Many workers were afraid of the instability associated with a private-sector job and were reluctant to leave the WPA. As Margo explains, “By providing an alternative to the employment search (which many WPA workers perceived, correctly or not, to be fruitless), work relief may have lessened downward pressure on nominal wages” (p. 340). This lack of adjustment of the wage rate may have slowed the economy’s return to full employment. The number of persons employed by the WPA is given in Figure 1. Gavin Wright points out that “WPA employment reached peaks in the fall of election years” (Wright 1974, p. 35). Source: Wright (1974), p. 35. The work done by the organization stands as a tribute to the WPA. Almost every community in America has a park, bridge or school constructed by the agency. As of 1940, the WPA had erected 4,383 new school buildings and made repairs and additions to over 30,000 others. More than 130 hospitals were built and improvements made to another 1670 (MacMahon, Millet and Ogden 1941, pp. 4-5). Nearly 9000 miles of new storm drains and sanitary sewer lines were laid. The agency engaged in conservation work planting 24 million trees (Office of Government Reports 1939, p. 80). The WPA built or refurbished over 2500 sports stadiums around the country with a combined seating capacity of 6,000,000 (MacMahon, Millet and Ogden 1941. pp. 6-7). Addressing the nation’s transportation needs accounted for much of the WPA’s work. By the summer of 1938, 280,000 miles of roads and streets had been paved or repaired and 29,000 bridges had been constructed. Over 150 new airfields and 280 miles of runway were built (Office of Government Reports 1939, p. 79). Because Harry Hopkins believed that the work provided by the WPA should match the skills of the unemployed, artists were employed to paint murals in public buildings, sculptors created park and battlefield monuments, and actors and musicians were paid to perform. These white-collar programs did not escape criticism and the term “boondoggling” was added to the English language to describe government projects of dubious merit. Work relief for the needy was the putative purpose of the WPA. Testifying before the Senate Special Committee to Investigate Unemployment and Relief in 1938, Corrington Gill — Assistant to WPA administrator Harry Hopkins — asserted, “Our regional representatives . . . are intimately in touch with the States and the conditions in the States” (U.S. Senate 1938, p. 51). The Roosevelt administration, of course, asserted that dollars were allocated to where need was the greatest. Some observers at the time, however, were suspicious of what truly motivated the New Dealers. Mr. Smith: I have been interested in the analysis the Senator has made of the wealth and population which showed that Wisconsin and Georgia were so nearly equal in those features. I wondered if the Senator had any way of ascertaining the political aspect in those two States. Mr. Russell: Mr. President, I had not intended to touch upon any political aspects of this question. Mr. Smith: Why not? The Senator knows that is all there is to it (U.S. House of Representatives 1939, p. 926). Scholars have begun to examine the New Deal in this light, producing evidence supporting Senator Smith’s assertion that political considerations helped to shape the WPA. An empirical analysis of New Deal spending priorities was made possible by Leonard Arrington’s discovery in 1969 of documents prepared by an obscure federal government agency. “Prepared in late 1939 by the Office of Government Reports for the use of Franklin Roosevelt during the presidential campaign of 1940, the 50-page reports — one for each state — give precise information on the activities and achievements of the various New Deal economic agencies” (Arrington 1969, p. 311). Using this data source to investigate the relationship between WPA appropriations to the states and state economic conditions makes the administration’s claims of allocating dollars to where need was greatest difficult to support. Instead, evidence supports a political motivation to the pattern of expenditures. While the legislation that funded the WPA sailed through the House, a vocal minority in the Senate argued against the measure — a fact the Roosevelt administration did not forget. “Hopkins devoted considerable attention to his relations with Congress, particularly from 1935 on. While he continually ignored several Congressmen because of their obnoxious ways of opposing the New Deal . . . he gave special attention to Senators . . . who supported the work relief program (Charles 1963, p. 162). Empirical results confirm Charles’ assertion; WPA dollars flowed to states whose Senators voted in favor of the 1935 legislation. Likewise, if the state’s Senators opposed the measure, significantly fewer work relief dollars were distributed to the state. The matching funds required to ‘buy’ WPA appropriations were not uniform from state-to-state. The Roosevelt administration argued that allowing them discretion to determine the size of the match would enable them to get projects to the states with fewer resources. Senator Richard Russell of Georgia complained in a Senate speech, “the poorer states . . . are required to contribute more from their poverty toward sponsored projects than the wealthier states are” (Congressional Record 1939, p. 921). Senator Russell entered sponsor contributions from each state into the Congressional Record. The data support the Senator’s assertion. Citizens in relatively poor Tennessee were forced to contribute 33.2 percent toward WPA projects while citizens in relatively rich Pennsylvania were required to contribute only 10.1 percent toward their projects. Empirical evidence supports the notion that by lowering the size of the match, Roosevelt was able to put more projects into states that were important to him politically (Couch and Smith, 2000). The WPA represented the largest program of its kind in American history. It put much-needed dollars into the hands of jobless millions and in the process contributed to the nation’s infrastructure. Despite this record of achievement, serious questions remain concerning whether the program’s money, projects, and jobs were distributed to those who were truly in need or instead to further the political aspirations of the Roosevelt administration. Arrington, Leonard J. “The New Deal in the West: A Preliminary Statistical Inquiry.” Pacific Historical Review 38 (1969): 311-16. Charles, Searle F. Minister of Relief: Harry Hopkins and the Depression. Syracuse: Syracuse University Press, 1969. Congressional Record (1934 and 1939) Washington: Government Printing Office. Couch, Jim F. and Lewis Smith (2000) “New Deal Programs and State Matching Funds: Reconstruction or Re-election?” unpublished manuscript, University of North Alabama. Higgs, Robert. Crisis and Leviathan: Critical Episodes in the Growth of American Government, New York: Oxford University Press, 1987. Kurzman, Paul A. Harry Hopkins and the New Deal. Fairlawn, NJ: R.E. Burdick, 1974. MacMahon, Arthur, John Millett and Gladys Ogden. The Administration of Federal Work Relief. Chicago: Public Administration Service, 1941. Margo, Robert A. “The Microeconomics of Depression Unemployment.” Journal of Economic History 51, no. 2 (1991): 333-41. Office of Government Reports. Activities of Selected Federal Agencies, Report No. 7. Washington, DC: Office of Government Reports, 1939. Reading, Don C. “A Statistical Analysis of New Deal Economic Programs in the Forty-eight States, 1933-1939.” Ph.D. dissertation, Utah State University, 1972. US House of Representatives. Congressional Directory, Washington, DC: US Government Printing Office, 1938 and 1939. US Senate, Special Committee to Investigate Unemployment and Relief (‘Byrnes Committee’). Unemployment and Relief: Hearings before a Special Committee to Investigate Unemployment and Relief, Washington, DC: US Government Printing Office, 1938. Wright, Gavin. “The Political Economy of New Deal Spending: An Econometric Analysis.” Review of Economics and Statistics 56, no. 1 (1974): 30-38. Heckelman, Jac C., John C. Moorhouse, and Robert M. Whaples, editors. Public Choice Interpretations of American Economic History. Boston: Kluwer Academic Publishers, 2000. Couch, Jim F. and William F. Shughart. The Political Economy of the New Deal Edward Elgar, 1998.